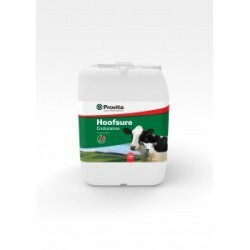 Provita Hoofsure Endurance is a unique scientifically formulated footbath solution containing organic acids, tea-tree oil and wetting agents. Provita Hoofsure Endurance is a unique scientifically formulated footbath solution containing organic acids, tea-tree oil and wetting agents. Its highly concentrated formula (1:100) means it can be used up to 500 cows passes in a 200 litre footbath.